Finding a multi-billion dollar diamond discovery is something that geologist Buddy Doyle dreams of every day. For well over a decade, it’s been his obsession. But it would be foolish to dismiss him as a self-deluded wishful thinker. History bears testament to him being quite the opposite. Which is because he’s done it all before, unearthing a rich diamond deposit — that became the Diavik mine — in Canada’s far north, while still a relatively youthful up-and-comer. This is when he was exploration manager for Kennecott Canada Exploration Inc. — a subsidiary of the world’s biggest mining company, Rio Tinto plc. Within weeks, we’ll know if Doyle can do it again. And he likes his odds, even though they’re still a long shot at best. Now in his 50s, he’s far shrewder and scientifically savvier than the first time around, he points out. He also has the benefit of vastly improved diamond-hunting technology, as well as the collaboration of one of the world’s top diamond-hunting gurus, Dr. Chris Jennings. Even though his last claim to fame was a generation ago, Doyle hasn’t exactly been idle since. In fact, his latest shot at glory has been over a decade in the making. During this time, his dogged pursuit of a new diamond discovery has seen him traverse much of the frigid vastness of the Northwest Territories (NWT). Though he’s drilled without success elsewhere in recent years, he’s learned invaluable lessons each time. Now we’re about to see if he’s amassed enough geological savoir faire to pull off a masterstroke in the sunset of his 30-year-plus career. A modest man by nature, Doyle’s confidence doesn’t seem to be over-inflated. After all, he has the support and encouragement of some important players in the diamond exploration business. They include world-famous diamond hunter, Dr. Jennings, who helped select the best drill targets on Arctic Star’s property, which is called Redemption. Dr. Jennings also played a key preliminary role in the discovery of the rich Diavik diamond deposit in 1992. 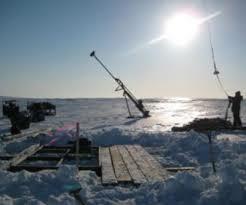 (The NWT’s other diamond mine, Ekati, was discovered a year earlier). It was Dr. Jennings who originally found the right locality in the NTW to zero-in on Ekati’s hidden treasures. And that was quite an achievement considering that the NTW is bigger than Germany, France and Spain combined. And it was Doyle who next figured out the correct spot to drill in order to reveal the exact whereabouts of Ekati’s huge bounty all those years ago. Now Dr. Jennings is putting his money where his mouth is. He’s committed close to a million dollars of his own funds for this drill project, largely because he really likes what he sees — in terms of all the physical clues that a new multi-billion dollar discovery may be within reach. (More on this in a moment). In recent years, Doyle has been doing his geological sleuthing work at the helm of a small exploration company, Arctic Star (TSX.V: ADD) — a TSX Venture Exchange publicly-traded company. Ironically, Doyle’s long, circuitous search for diamonds has finally led him to a locality that’s within a 50-kilometer radius of both the Ekati and Diavik mines. And that may be a good thing. Which is because the rock formations that often host diamonds — known as kimberlite pipes — typically occur in clusters that resemble a shotgun blast spread out over an area in diameter of up to 100 kilometers. So when one of them is located, geologists know that other potentially diamond-rich kimberlite pipes are likely nearby. That said, Arctic Star’s ten or so top-priority targets were selected primarily because of their excellent geochemistry. This means they’re ideally located at the head of a prolific “dispersion train” of diamond indicator minerals (significantly, one that also includes tiny diamonds). In other words, an approximately 40-kilometre-long indicator mineral trail comes to an abrupt end in the immediate vicinity of Arctic Star’s drill targets. This situation is comparable to a trail of crumbs leading back to a loaf of bread. Even though Arctic Star’s drill program — which started late last week —will cost up to a million dollars, it may end up being a small price to pay. And it’s Arctic’s joint venture partner, North Arrow Minerals, that’s footing the bill (along with Dr. Jennings). It can earn up to a 55% stake in the joint-ventured project by spending as much as CDN $5 million on exploration work by July of 2017. In fact, an economic discovery would make both these upstart companies the toast of Canada’s mining investment community. After all, these diamond fields have already yielded unimaginable buried wealth. Consider this: the NWT’s two diamond mines have collectively produced over US $25 billion worth of high-quality gems so far. There are historic precedents for the kind of stratospheric success that shareholders of Arctic Star and North Arrow dream of. In fact, several other mining juniors have hit the geological jackpot since the early 90s. And of course, they include Dia Met Minerals, which discovered the Ekati mine. This fabulous find propelled the company’s share price from mere pennies in 1991 to over $67 the following year. Nonetheless, Doyle remains convinced that the NWT has at least one more dazzling secret to give up. But why does Arctic Star believe it can beat the odds when so many other diamond exploration mining juniors have failed? It’s all about the “exceptional” geochemistry that has led him to Arctic Star’s high-priority drill targets at Redemption, Doyle says. Scientific advancement is also on Arctic Star’s side, he adds. Drill results are expected by the end of April. Disclaimer: Marc Davis does not directly or indirectly have any stock positions in any of the companies mentioned in this article.